What Happened to the 1914 Generation? 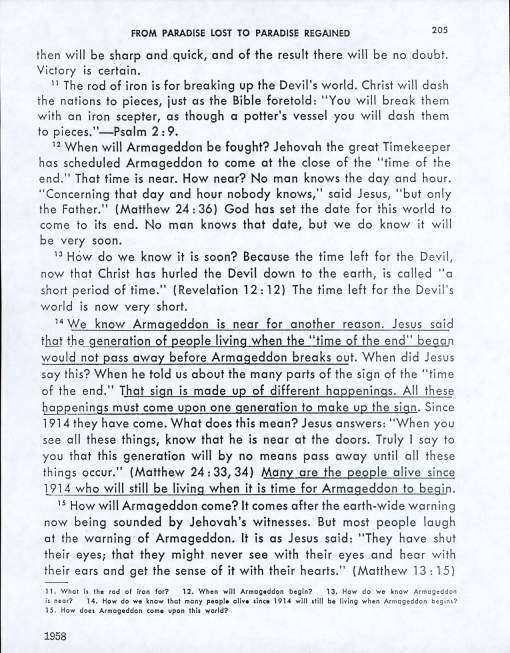 For many decades the Watchtower Bible and Tract Society taught that Armageddon would occur within one generation of 1914. Witnesses lived their lives in anxious anticipation of the promised new earth at any moment. This was no conjecture. It was a firm doctrine taught by the Watchtower. In fact, if you were a Jehovah’s Witness prior to the winter of 1995, this teaching was in your face every other week in the publication Awake! Suddenly, in the masthead of the November 8, 1995 publication, the 1914 generation mysteriously disappeared. Check out the masthead of the following two consecutive Awake magazines. What happened? Did the Faithful and Discreet Slave get new light --- again? Or did they run out of time? Lets check some prior publications concerning the 1914 generation. Maybe this will give us some new light of our own. "Some persons living A.D. 1914 when the series of foretold events began will also be living when the series ends with Armageddon. All the events will come within the span of a generation." Note that this same article defines the length of a generation as, "the average lifetime of man". "Many are the people alive since 1914 who will still be living when it is time for Armageddon to begin." "Was Jesus using the word 'generation' in a symbolic way? No, we should not say that the word “generation” here has a symbolic meaning....The “generation” of Matthew 24:34 includes persons alive at the time that the war in heaven began in 1914....Members of that generation will see the end of this world." 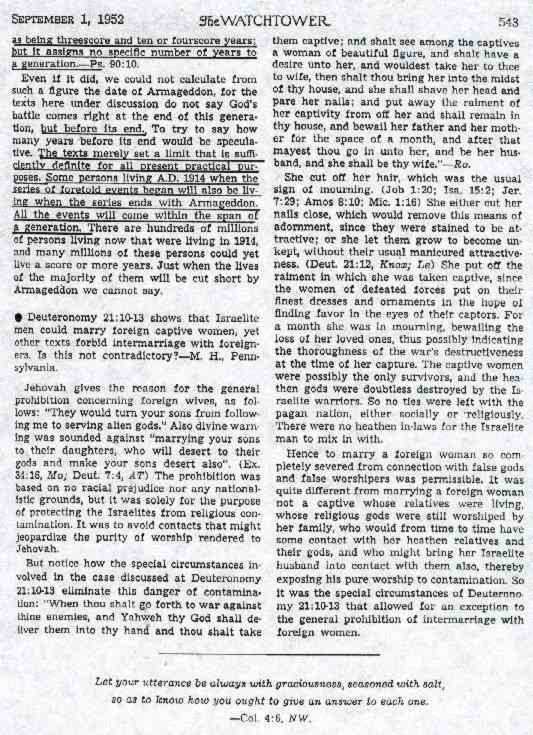 "Jesus was obviously speaking about those who were old enough to witness with understanding what took place when the last days began....Even if we presume that youngsters 15 years of age would be perceptive enough to realize the import of what happened in 1914...."
So according to the above article, the 1914 generation doesn’t include babies or children. One must have been 15 years old in 1914 to be considered part of the generation. "Our generation will see the end of the present pressure-ridden order. In fact, there is even good reason to hope that a new order of God’s making may begin within the present decade....The generation living in 1914 when ’these things started to occur’ has now grown old....That means that the due time for their full occurrence must be near at hand, very close." Now we’re starting to see a sense of urgency. After all, the generation is getting up there in years. "Thus, when it comes to the application in our time, the ‘generation’ logically would not apply to babies born during World War I." The Watchtower is sticking to their guns. Babies and children are too young to be part of the 1914 generation. 15 years of age is the criteria. What will they do next? "It is the generation of people who saw the catastrophic events that broke forth in connection with World War I from 1914 onward....If you assume that 10 is the age at which an event creates a lasting impression...."
Brilliant! They just stretched the generation and bought 5 more years. "If Jesus used ‘generation’ in that sense and we apply it to 1914, then the babies of that generation are now 70 years old or older....Some of them will “by no means pass away until all things occur,"
Give them an inch and they’ll take a yard! The Watchtower just violated their own standards and included babies in the 1914 generation. By doing this they bought another 10 years. Fascinating! "Most of the generation of 1914 has passed away. However, there are still millions on earth who were born in that year or prior to it....Jesus’ words will come true, ‘this generation will not pass away until all these things have happened." This last quote was in 1988. If we calculate the age of the 1914 generation now, in 2000, and even if we include infants born in 1914, the youngest person would be 86 years old. Since 86 years is well beyond the limits of a generation, we can conclude that this Watchtower teaching was a huge flop! No wonder why they nixed it from the Awake masthead. So, the 1914 generation doctrine is now DOA. It will probably end up hidden in the forbidden archives at the Kingdom Hall libraries. New converts will never know about this failed prophecy; maybe the Watchtower’s biggest! Veteran Witnesses will never breathe a word about it for fear of being disfellowshipped. Is it any wonder that there was never any prophecy promulgated by the Watchtower that came true? I mean zero. Not even one came to pass by accident. 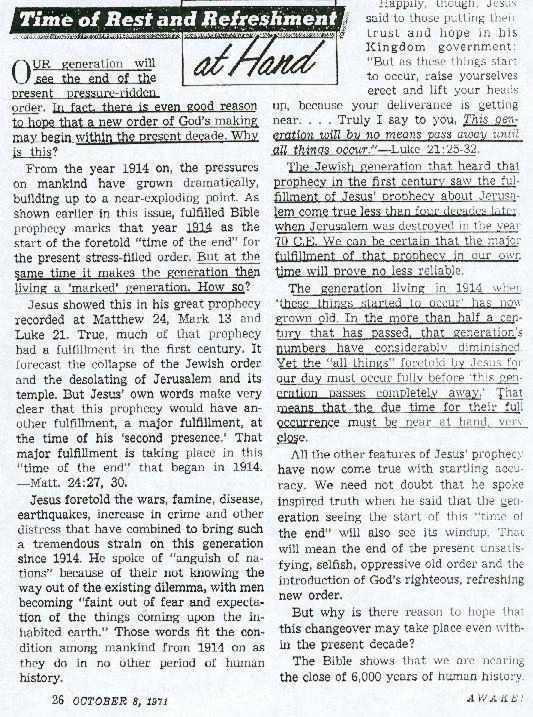 By adding the failure of the 1914 generation to a long list of other failed prophecies, (see False Prophecies Article), we can confidently conclude that the Watchtower Bible and Tract Society is not Jehovah’s channel of truth. This has been proven over and over again by their own publications. Salvation can not be attained by following a genuine false prophet. Our hope is that you not only flee from such an organization, but run into the arms of a loving Savior. It is only by faith in Jesus Christ that we can be assured of eternal life (Acts 4:12, Gal. 2:16, 1Jn. 5:13). Yes, there is life outside of the Watchtower. Real life. Eternal life! Our prayer is that you choose this life for yourself.